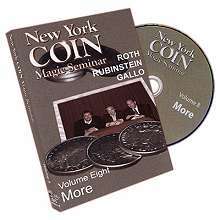 Volume Eight (More) contains two hours of more great magic from the New York Coin Guys. David Roth performs for the FIRST time on DVD his Blank Coin Routine, and follows with his rendition of his classic Stonehenge routine. Dr. Rubinstein performs a version of Nest of Boxes that was the hit of his last trip to Japan, He follows by showing a polarized plastic disc that when rubbed, becomes a real coin. Smileys is a very commercial coin effect where a sad face drawn on a coin changes and changes, bringing a smile to both the coin AND the spectator. The best part, though, is yet to come, as Rubinstein reveals for the first time on DVD his Stealth palm, sure to find a place in every coin man's repertoire! Not to be undone, Mike Gallo gives you more great magic, with a Gaddabout coins routine that has a dynamite ending that you will use! Quarter Transpo is a strange transposition of 4 quarters and 4 half dollars. Childhood memories is Ramsay's Coins and Cylinder routine with a story that gives a reason for your props, and makes the routine even more spectator friendly. The section ends with special guest Vic Trabucco presenting a very practical coins across routine. But wait, there's more! The Bonus section starts off with a clever Okito Box routine by Mike Gallo, and a discussion of the breakout move by David Roth. Rubinstein performs a routine called Smileys Jr.,based on the effect presented elsewhere on the DVD. There is a rare 1983 performance from the late Geoff Latta doing his classic CopSilBrass, followed by the first of three sections by special guest Al Schneider on coin theory. The Bonus section ends with a discussion by Schneider on a new way to do the Pop Out Move! Volume 9 - Much More, the title of volume 9! David Roth performs and explains his own, unpublished version of the Nest of Boxes, with the classic Roth touch, and for the first time on any DVD, performs his Deep Back Clip Coins Across that should give thrills for the guys looking for knuckle busting stuff. 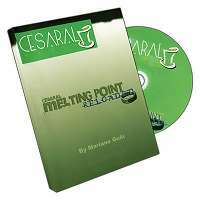 Dr. Michael Rubinstein makes a signed coin travel to underneath a business card three times, with his classic Triple Coin to Card, and follows with his one of his favorite all time routines, Quadra Coin Reverse Matrix. Stealth Spellbound is an uber clean triple spellbound using stealth palm, and coins mysteriously appear and disappear into the air with Stealth Hanging Coins. Mike Gallo is up next, with a self working stunner called Thieves and Sheep. Differences is a copper silver routine where coins move around and around. He finishes with an eye popping routine called Bust Up Bucks, based on a Dr. Sawa idea, where a dollar breaks into 2 half dollars and then into 4 quarters. Special guest Vic Trabucco is back with a stand up coin vanish, and special guest Scotty York makes his New York Coin Magic Seminar debut with his famous Copper Silver Transposition, with the patter that other magicians have tried to prevent him from revealing, as its just too good!! The Bonus section is bursting with much more! Gallo goes into detail on a new Okito box routine, and Roth discusses the proper way to do the spidergrip vanish. Rubinstein makes sure you understand the R.O.P.S. move, and explains a NEW application for it. Special Guest Al Schneider presents the second part of his coin theory, and newcomer Bill Citino offers a brilliant hanging coins routine. Special guest Scotty York finishes up with a trick he always does at the bar, called Nickle Saver. Volume 10 - Still More, with almost two and a half hours in Volume 10! David Roth shows that size does matter with Fugitive Coins. You will learn all about coin boxes and moves with Roth's in depth discussion on the Okito Box. Dr. Rubinstein updates a handling of an old effect with Magnetic Coins III. Ultra Reverse Matrix was supposed to be an entry in Tannens New Stars of Magic series in the 80's, but now its yours. Rubinstein again showcases Stealth palm with Stealth Copper Silver Transposition, but you can see just how special Stealth palm can be with the Stealth Showcase, consisting of productions, a coins across, and a gaddabout coins routine with a killer ending! Mike Gallo goes wild with his Okito Coin Box routine, and pennies become pennies in Nonsense. The biggest reaction of all the DVD effects, however, comes with Old Faithful, a routine that finds its roots in a Roth effect, but goes the other way! 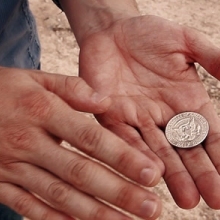 Vic Trabucco is up next with another practical coin vanish, and the legendary Scotty York hits a homer with his A Sweet Coin Trick, where a signed coin is found in a sugar packet. The Bonus section contains the third installment of Al Schneider on Coins, where he puts his theories to work with some amazing coin vanishes. 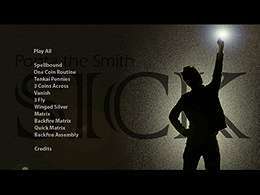 Scotty York showcases his Two Copper one Silver routine in the Numismatist. Vic Trabucco performs Glass Transit, which ends with a vanish in the classic Trabucco style. Guest host Marc DeSouza gives up his award winning routine, A Matter of Time, and the section ends with an in depth panel discussion by the New York Coin guys on the Retention Pass.